Anne Hillerman is the author of Tony Hillerman's Landscape: On the Road with Chee and Leaphorn (Harper). The book features more than a hundred color photographs by Don Strel of the Indian Country in which the Chee/Leaphorn mysteries are set. Popular speakers on the topics of writing, the Southwest, and the work of Tony Hillerman, Hillerman and Strel have spoken at numerous schools, universities, festivals, conferences, religious and local organizations, and other benefits and events across the Southwest and the nation. Tony Hillerman (1925-2008), was an Albuquerque, New Mexico, resident since 1963, and the author of 29 books, including the popular 17-mystery series featuring Navajo police officers Jim Chee and Joe Leaphorn, two non-series novels, two children's books, and nonfiction works. He had received every major honor for mystery fiction, and the Western Writers of America honored him with the Wister Award for Lifetime Achievement in 2008. He served as president of the prestigious Mystery Writers of America, and was honored with that group's Edgar Award and as one of mystery fiction's Grand Masters. In 2001, his memoir, Seldom Disappointed won both the Anthony and Agatha Awards for best nonfiction. Tony Hillerman's Landscape is a stunning collection of original documentary photographs of the landscape that was integral to his writing. Alongside these breathtaking photos are brief synopses of Hillerman's novels, descriptive text from the novels to accompany the photos, Tony Hillerman's own comments about the sites, and narrative information on the locations pictured. Compiled with remembrances by his eldest daughter, Anne Hillerman, with original photos from Don Strel it is a timely showcase of a hauntingly beautiful landscape that captured one man's imagination for a lifetime, as well as a daughter's tribute to her father. For long-time Hillerman fans, or those discovering his work for the first time, this book of photos lures readers in, transporting them to another time and place. Anne Hillerman is a director of the Santa Fe-based WORDHARVEST Writers Workshops and the Tony Hillerman Writers Conference: Focus on Mystery, both of which she helped establish in 2001. She was instrumental in the establishment of the Tony Hillerman Prize for best first mystery set in the Southwest. Her newest book, Gardens of Santa Fe, will be released in April, 2010 by GibbsSmith Publisher. She is also the author of Santa Fe Flavors: Best Restaurants and Recipes, (GibbsSmith), Children's Guide to Santa Fe (Sunstone Press), The Insider's Guide to Santa Fe (Globe Pequot), Done in the Sun (Sunstone Press) and Ride the Wind: USA to Africa (Rio Grande Publishing). 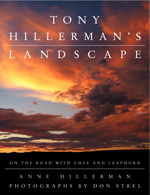 Hillerman is also the Santa Fe restaurant reviewer for the Albuquerque Journal and Journal North and works as a writing coach on fiction and non-fiction projects. In her 20 years as a journalist, she worked as editorial page editor for the Albuquerque Journal North and the Santa Fe New Mexican, and an arts editor for both papers. She was the editor of New Mexico Almanac, a publication for New Mexico visitors, for three years. Hillerman has received awards for her work including recognition for feature stories and columns from the New Mexico Press Women and the National Federation of Press Women, and a first place for editorial writing from the New Mexico Press Association. Her cookbook/restaurant guide Santa Fe Flavors was nominated for the 2009 New Mexico Book Award. The New Mexico Chapter of Women in the Arts has recognized Hillerman as 2008's "Outstanding Woman Author." She was "Board Member of the Year" for the Santa Fe chapter of the American Red Cross in 2007 and "Communicator of Achievement" for the New Mexico Chapter of the National Federation of Press Women. Photographer Don Strel has had his photos published in numerous books, magazines and newspapers. He is currently the director of the Southwest Assignments, a design and public relations agency that he founded in 1985. His clients have included the Eight Northern Indian Pueblos, The New Mexico Chapter of the International Women's Forum and Ski Santa Fe. Also, a popular speaker, Strel spoke with Hillerman at many of the same conferences, festivals, and events in addition to museums and universities across the country. Strel spent 16 years as the New Mexico coordinator of a special ski event for the Jimmie Heuga Center, raising money to help people with MS. He taught design at San Francisco State University and Northern Illinois University, and served as the director of the Museum of Fine Arts, Museum of New Mexico, in Santa Fe. 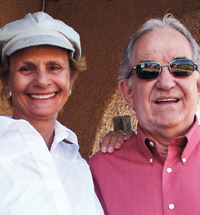 Hillerman and Strel, her husband, live in Santa Fe, New Mexico.